The posting of Ron’s crow tale below reminded me of another crow story – actually a crow and falcon story from a couple of years ago. 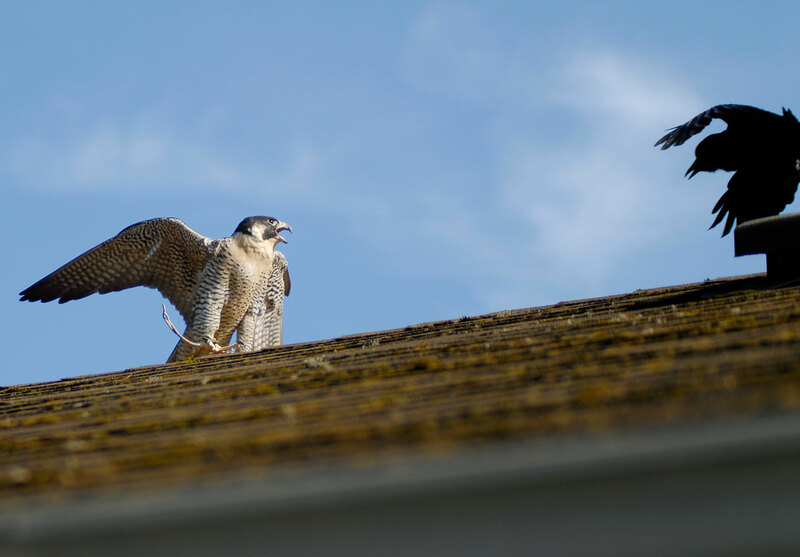 On a roof across the street from where I live in North Greenlake, a falcon was perched for about half an hour. It wasn’t long before crows found it and commenced to attack. The peregrine falcon had flown off from its handler at Woodland Park Zoo and seemed puzzled and alarmed by the diving crows, but was only driven off after the following picture was snapped, using a telephoto lens. Officials from the zoo combed our neighborhood minutes later, but to no avail. The missing falcon was found early the next morning near Northgate.